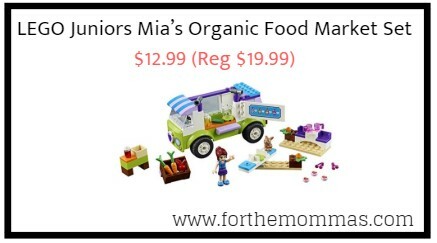 Amazon has LEGO Juniors Mia’s Organic Food Market Set for $12.99 (Reg $19.99) with FREE Shipping on orders over $25.00 or with Amazon Prime Orders. Start the day out right with goodies from LEGO Juniors Mia’s Organic Food Market, featuring an Easy to Build truck with Starter Brick chassis, opening side and rotating sign, plus a spinning merry-go-round, stand-alone crates and a picnic table with seats. This colorful and creative food market playset also includes a simple guide to build and play, with bigger starter set pieces to help build confidence in younger children. Includes a mini-doll figure and bunny figure.